About a month or two ago, Apple did a great thing with the iTunes App store review process. They required that reviews had to be written by people who actually downloaded the app. This eliminated a bunch of the "noise" reviews where it seemed you had people with free time on their hands and nothing better to do that post pointless reviews that said things like, "Is this app good? If so, click yes. ", or those where someone wrote something like, "This app is so stupid I'm not even gonna try it!" and then gave it a 1 star review. With the 2.2 iPhone OS update, Apple made another change to the review process. When you delete an app off your iPhone, an alert box pops up asking you to give a quick rating of the app - no text description, just a 1 to 5 star rating. It's a clever idea, but it's one that is going to give a heavy bias toward low star ratings. If someone is deleting the app, odds are they didn't find the app useful, so odds are they are going to give it a low rating. Now the problem is, all the people who really like the app continue to keep it on their phone, so they'll never give it a positive rating unless they return to iTunes to specifically write a review. I've already noticed this bias showing up with my apps. Over the past few days since the 2.2 OS update has been released, I noticed the average rating of my apps steadily going down while at the same time, all the reviews with a text description were pretty much all positive 4 and 5 star reviews. Since the apps I've been writing are targeting very specific audiences, someone who downloads the app just because they see it's a new free app will most likely not be interested in it, so will tend to delete the app and then give it a low rating when prompted. Hopefully Apple will reconsider the idea of prompting for app reviews whenever the app is removed. Or maybe they could add the idea of prompting the user to write a review of an app they after they use it x number of times. absolutely! i realized this "bug" in the appstore rating system the moment i deleted my first app. 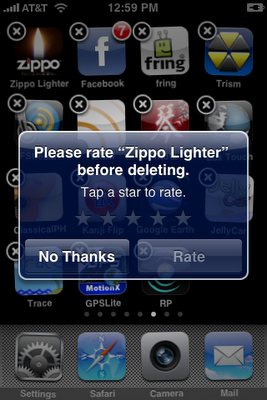 to personally counter it a bit, i give 5 stars if the app does as promised, regardless of my reason for deleting it. and i ignore the numerical rating at the appstore. if im interested in an app, try it (unless *all* r bad reviews). your solution is perfect: after x uses, a popup invites you to rate the app. i hope apple adopts it. We noticed this too, and I think we've come up with a good solution.. we call it Chomp Connect. It gives you a way to encourage your engaged users to review your app, without them having to leave it.